A great strategic sourcing methodology is where companies start looking for quantum savings from their supply chain. This is the latest evolutionary stage of purchasing and is characterized by real time data exchanged between suppliers and purchasing, contracting for long-term relationships, and purchasing involving multi-functional communication. Many different models exist for a good strategic sourcing methodology. However, every company that has executed this business philosophy shares certain basic components to their own execution. Generally, strategic sourcing is implemented with the goal of applying purchasing savings to some other aspect of the business. The first step to a good strategic sourcing methodology is, unsurprisingly, to define the goals for the company. Beginning with the end system in mind is critical to developing a working program. Identifying scope, objectives of the program and internal requirements are just the beginning. The second step is track and analyze internal spending. This can be done by aggregating data from current procurement and accounting systems or by the implementation of e procurement throughout the company. Sometime the tracking and analysis happens before the final strategic sourcing team is assembled, sometimes they are the ones responsible for the analysis. It requires knowledgeable personnel who understand something about the products they purchase in order to meet the cost control goals set for these functions. Generally in parallel with the internal analysis is an external market analysis by commodity. This is the stage where new potential vendors are identified, new RFI templates are developed and the team analyzes the impact of existing long term agreements. Many times, this is the point where an e procurement system or other robust acquisition tool becomes part of the overall product sourcing methods. 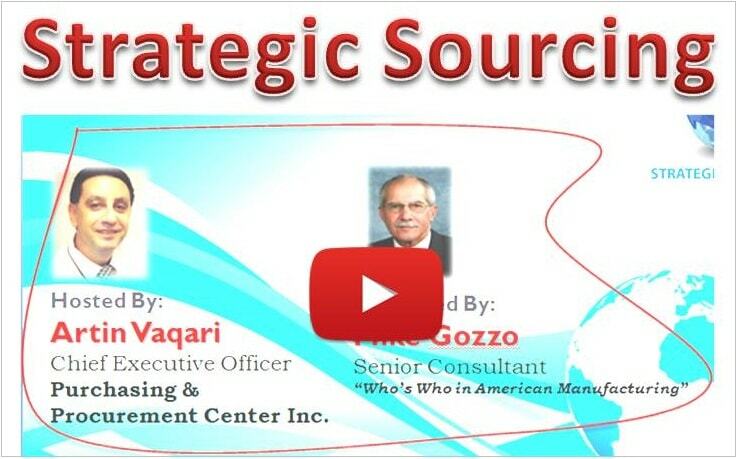 Once the strategy is in place, the actual mechanics of strategic sourcing can begin. RFP and reverse auction events can occur via multiple platforms. Once the RFPs result in supplier offers, in a company using strategic sourcing methodology, the contracts are examined from a total cost perspective rather than a raw cost perspective. Finally, awarding the contract is just the beginning. The buying company continues to communicate expectations, performance, supplier performance, and establishes both awards and penalties for various levels of service. Once the contracts are in place, a good strategic sourcing methodology demands that analysis continue on each contract. Only through constant monitoring, analysis and feedback to vendors regarding expectations can a good strategic sourcing methodology deliver the ongoing savings needed.